Heinrich Ehrler was born on 14 September 1917 at Oberbalbach in Nordbaden. He joined the army in 1935 and served with a flak unit in the Spanish Civil War. In 1940 he began flying training. On completion of his training he was posted to 4./JG 77 operating from bases in Norway. He gained his first victory in May 1940 shooting down a RAF Blenheim bomber. 4./JG 77 was redesignated 4./JG 5 on 1 February 1941. Ehrler recorded his second victory on 19 February 1942 and was now operating over the Northern front from bases in Finland and northern Norway. He was to score a total of 11 victories with the unit before he was promoted to Staffelkapitän of 6./JG 5 on 22 August. Between January and September 1942, Ehrler recorded 54 victories. 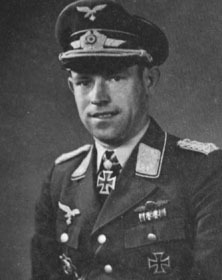 Leutnant Ehrler was awarded the Ritterkreuz on 4 September for 64 victories. On Saturday, 27 March 1943, Ehrler, in short order, downed five Russian Kittyhawks and Airacobras in aerial combat. While attempting to engage another Russian fighter his aircraft was hit by a 20mm cannon shell forcing his disengagement from the battle. He returned safely to base with slight wounds. On 1 June, he was named Gruppenkommandeur of II./JG 5. On 6 June, he claimed four Russian-flown Hurricanes to record his 96th through 99th victories. He gained his 100th victory the next day. After recording his 112th victory on 2 August, he was awarded the Eichenlaub (Nr 265). He shot down eight enemy aircraft on 17 March 1944 to record his 124th to 131st victories. He bettered this effort on 25 May 1944 downing nine to record his 147th to 155th victories. On 1 August 1944 he was promoted to Kommodore of JG 5. 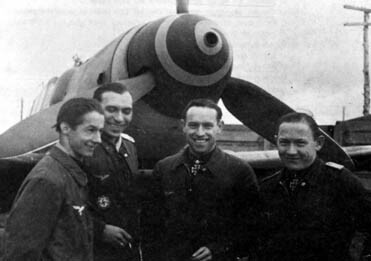 From left to right: Walter Schuck (206 v., RK-EL), Franz Dörr (128 v., RK), Heinrich Ehrler and Jakob Norz (117 v., RK) in front of a Bf 109G-6. On 12 November 1944 a message reporting incoming British bombers reached the 27 year old Geschwaderkommodore of JG 5. Ehrler, with his score at 199 victories, scrambled to intercept the Lancasters of 9 and 617 Squadrons at the head of a Gruppe of Bf 109s. The fighters were too late. The British Lancasters sank the battleship Tirpitz north of Tromsö with the loss of a thousand sailors. Ehrler was called to account for this disaster and at his court martial was accused of flying to get his 200th victory, instead of guiding his fighters from ground control. Ehrler was sentenced to three years Festungshaft, a more honourable punishment than imprisonment. Ehrler had been nominated for the Schwerten prior to the battleship disaster. The award was never made. He was stripped of his command. However, he was able to record his 200th victory on 20 November 1944. Ehrler joined JG 7 on 27 February 1945. His comrades knew that the old fire had been burned out of the gifted Ehrler. On 4 April 1945, he shot down two B-17s. Ehrler then reported he had run out of ammunition and rammed a third. Erhler did not return from the mission, and his body was found the next day at Schaarlippe near Berlin. Heinrich Ehrler achieved 208 victories, of which about 10 were recorded over the Western front. Included in his score are eight victories flying the Me 262.